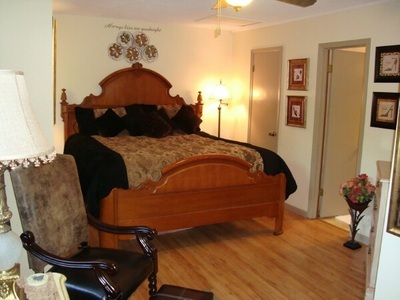 ​I am a caring local owner and will answer all inquiries personally! Indulge in the sumptuous amenities of the exquisite 3-story DREAM CHALET near Asheville NC: awesome massage chair, powerful deep hot tub for 6, Jacuzzi bath tub, 52" HDTV, DVD player, premium stations, movie library, gas log river stone fireplace, 20' cathedral ceiling, high-speed wireless Internet, plush king & queen beds with sumptuous bedding, fully-equipped kitchen with quality cookware, equipment & dishes, 80 gallon water heater for plenty of hot water, designer furnishings & thoughtful touches throughout. Walk the woodlands path to the creek with a bench swing suspended from a tree. 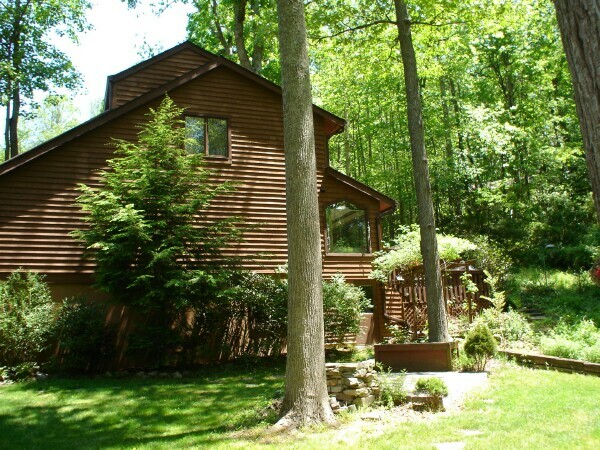 LOCATION: The DREAM CHALET vacation rental in Asheville NC is conveniently located at the south edge of Asheville (just a mile from Interstate 26, exit 40) close to restaurants and shopping. It is at the end of a cul-de-sac in a lovely woodlands setting in a quiet residential neighborhood of cedar chalets and the back yard borders a 33 acre woodlands. 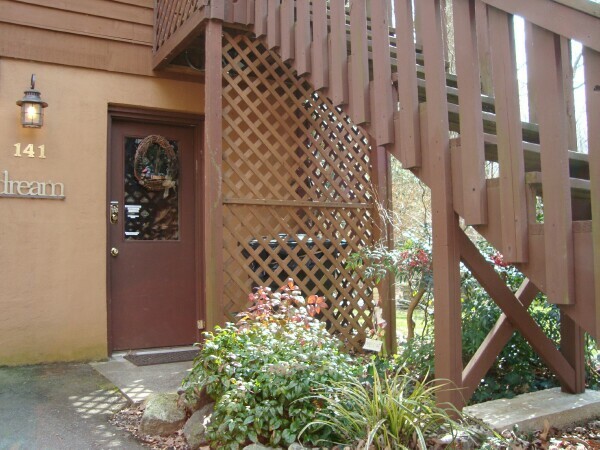 This convenient location between Asheville and Hendersonville is only 15 to 20 minutes to either downtown, the Biltmore Estate and hiking on the Blue Ridge Parkway. 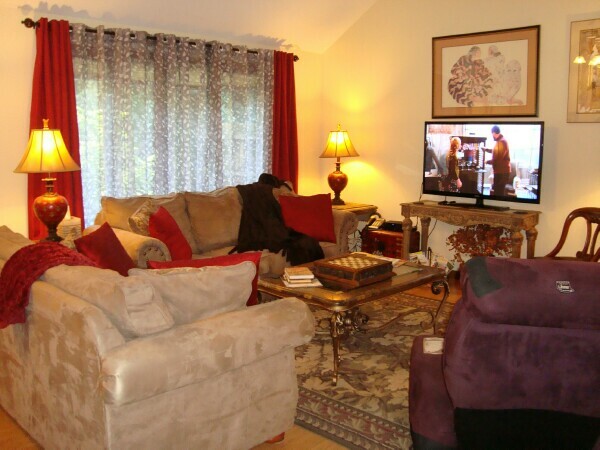 LIVING ROOM: The stunning living room has 20 foot cathedral ceilings, gas log river stone fireplace, wood floors, beautiful tapestry, luxuriously comfortable sofas with touches of bright colors, elegant furnishings and 52" HDTV with DVD player and a big movie library. 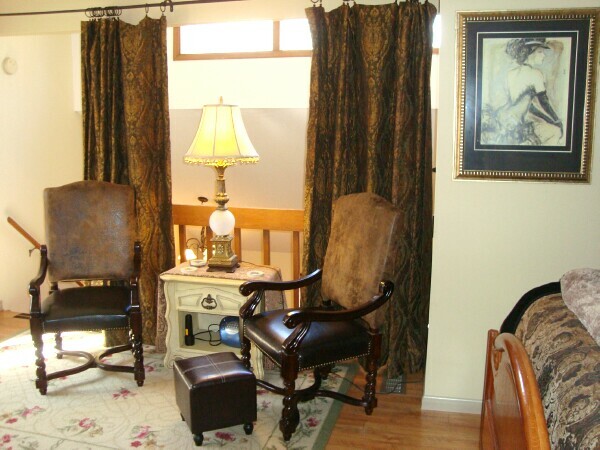 Enjoy experiencing an awesome massage in the high-tech “hands on technology” Massage Chair! 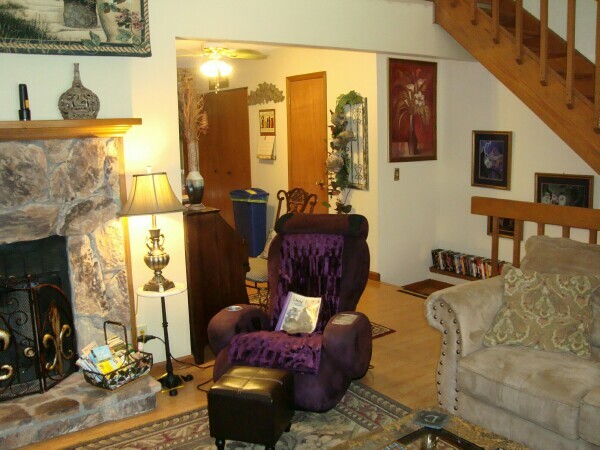 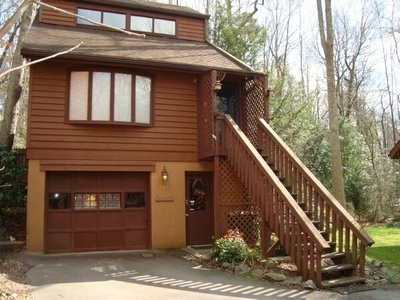 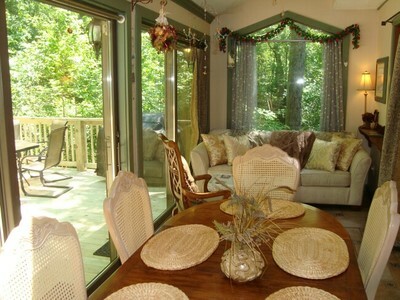 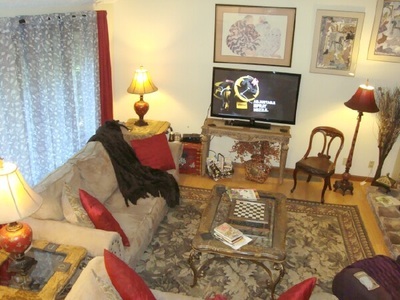 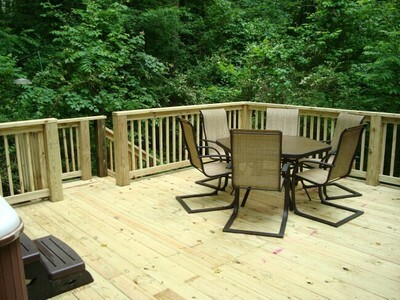 Not many home rentals in Asheville North Carolina offer so much! 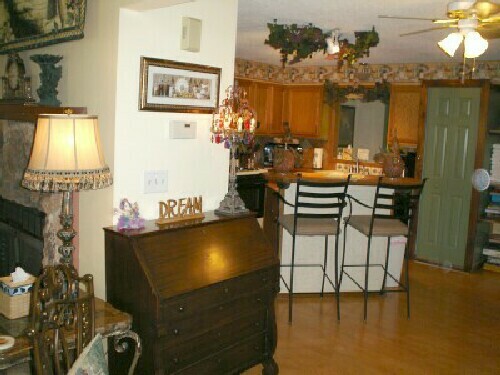 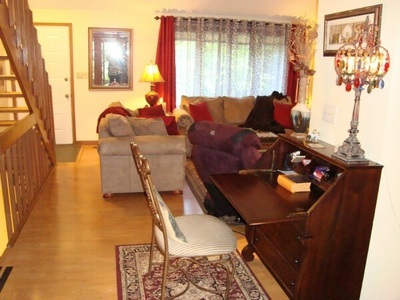 Just beyond the living room is the kitchen, half bath, laundry area & sunroom/dining room. 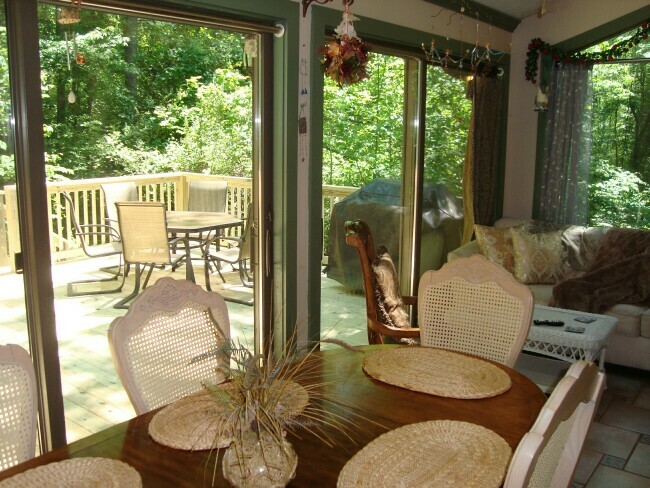 SUNROOM/DINING ROOM: Enhanced by the natural light from the two skylights, you'll enjoy the lush woodlands view from the fabulous floor-to-ceiling windows and sliding doors that look out on the lush forest and back deck with a 6 person powerful hot tub. 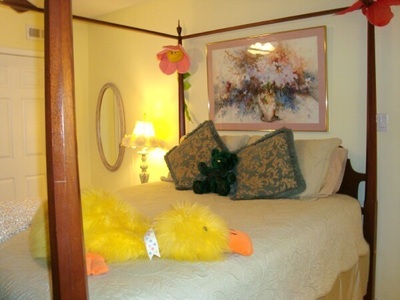 This room is located on the second level of the chalet. 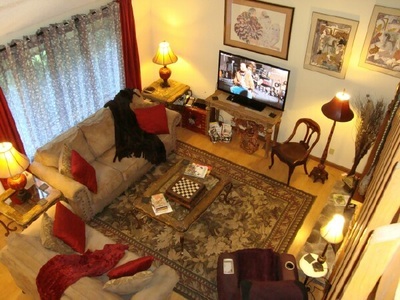 It's a peaceful place to eat your meals, relax in the sofa (queen sleeper) or watch TV. 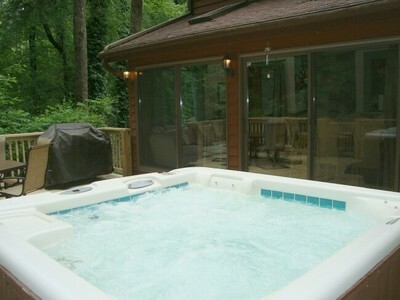 Lounging and relaxing is absolutely essential in North Carolina family vacations. KITCHEN: The classy gourmet kitchen has tile counters, an island prep area with eating bar and bar stools for lookers-on, wood flooring and full size appliances including a gas range/oven, refrigerator, microwave, dishwasher and disposal. 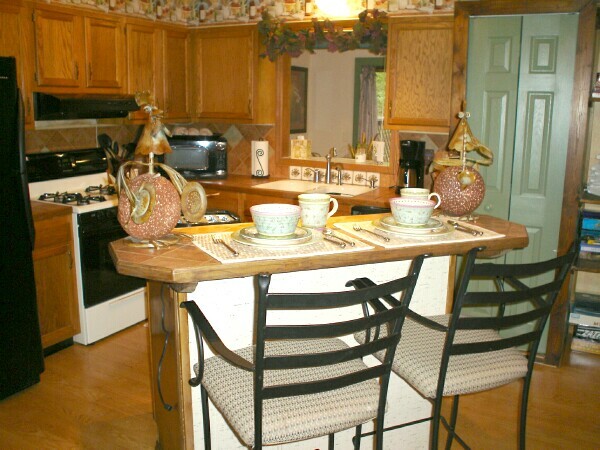 This cook’s kitchen located on the second level beside the living room and sunroom, and is well equipped for gourmet cooking & baking. 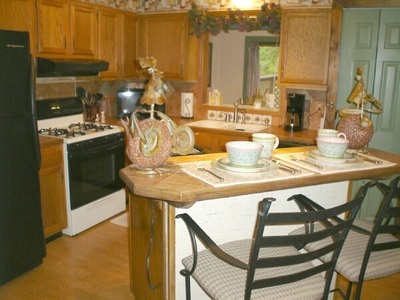 The knives are sharp, there’s a multitude of quality cookware, coffeemaker and even a coffee grinder for your freshly brewed coffee. 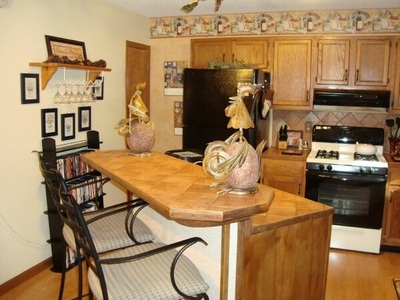 There are plenty of kitchen accessories & gadgets to please any chef. 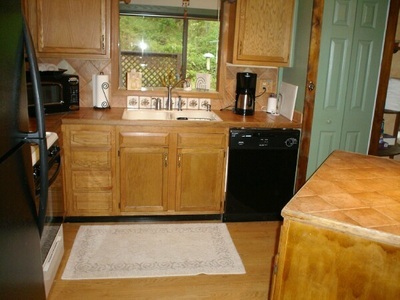 There’s an assortment of basic spices and plenty of storage space for your groceries. Serve your meals in the sunroom on cheerful hand-painted plates and quality silverware. Just off the kitchen is a half bath as well as a laundry area with an oversized “Capacity Plus Maytag Ensignia” washer & dryer for your use. 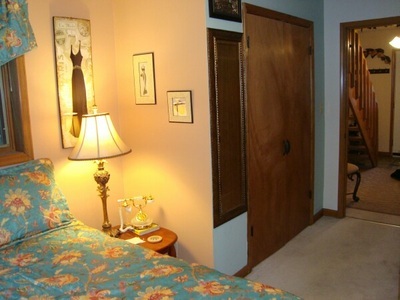 MASTER KING SUITE with PRIVATE BATH, WALK-IN CLOSET & CRIB AREA: Upstairs from the living room, you’ll find a tastefully decorated romantic master bedroom suite with an ornate carved oak bed with an ultra comfortable king mattress. 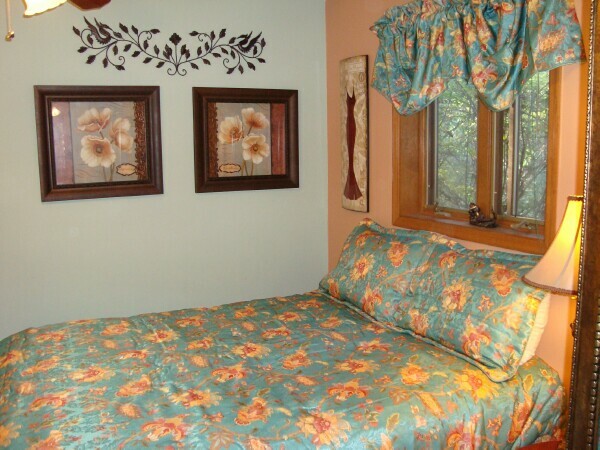 Luxuriate in the smooth high count cotton sheets, the butter soft blanket, the velvety “micro-plush” mattress pad and elegant bedding ensemble. 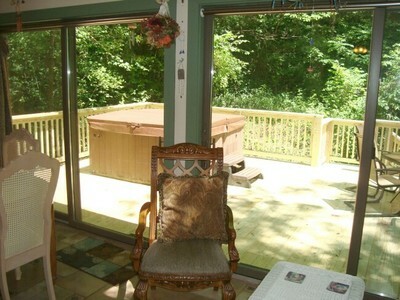 Located on the third level, your window is a bird’s eye view of the lush woodlands forest. 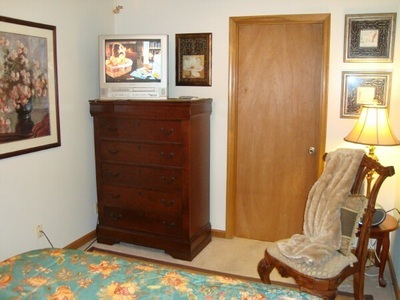 There’s a TV/DVD for bedtime watching. You have ample closet space with a large walk-in closet. 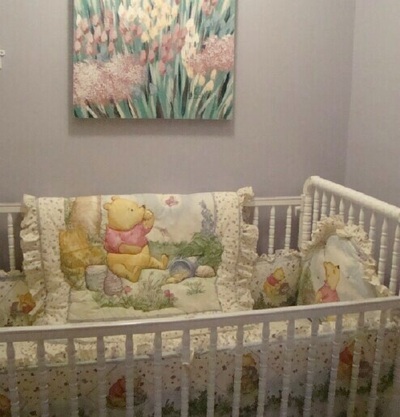 There's a second tiny room that has a darling baby crib & bedding. 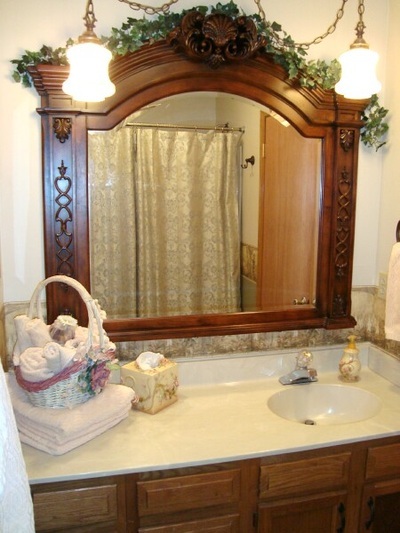 A tasteful bathroom featuring a skylight above your shower/Jacuzzi jet tub and sumptuous cotton towels complete the master suite. 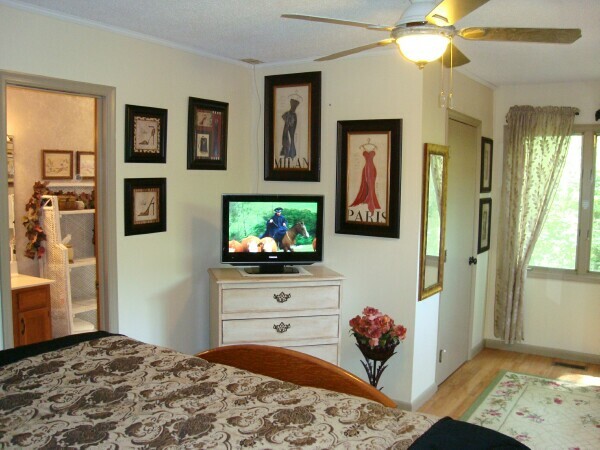 On the ground entrance level, downstairs from the living room, are a full bathroom and two bedrooms each with a quality queen bed with sumptuous bedding and TV/DVD. 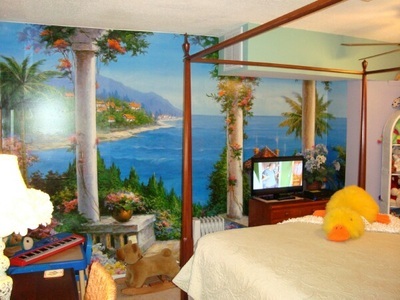 One of the bedrooms has a fun wall mural and children’s toys, stuffed animals & games. 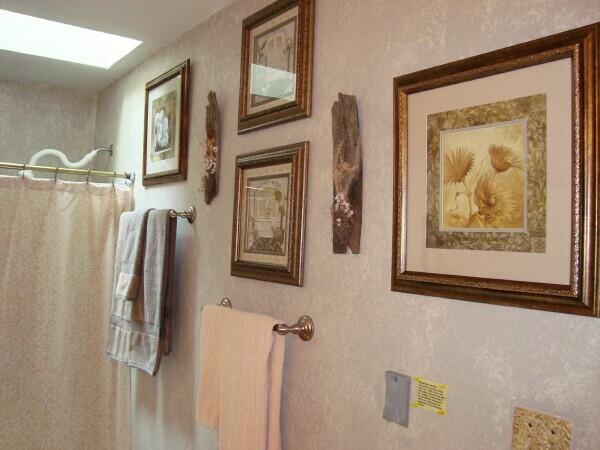 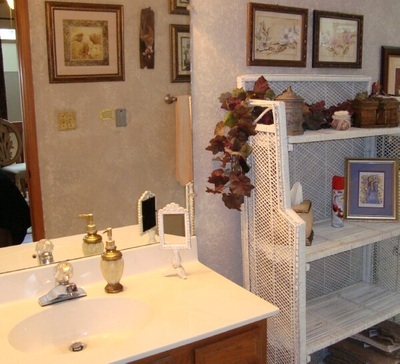 The bathroom is delightfully decorated, has a full tub and shower, and of course, wonderfully soft towels. For additional sleeping, the sunroom has a comfortable queen sleeper sofa with a back rest adjustment to recline. What a great setting to sleep in! 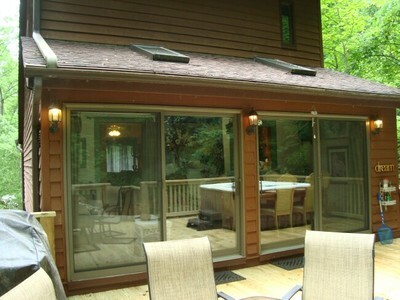 Watch the stars from the windows and skylights that surround you. 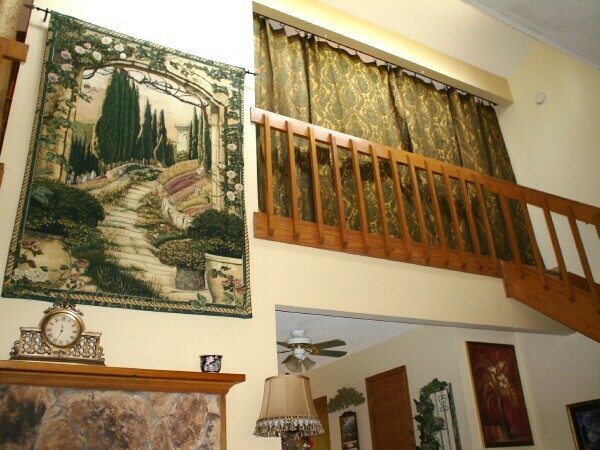 Draw the curtains for sleeping privacy. 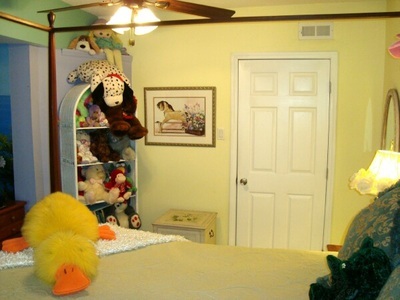 Also available is a twin air bed with built-in quick inflate/deflate motor. 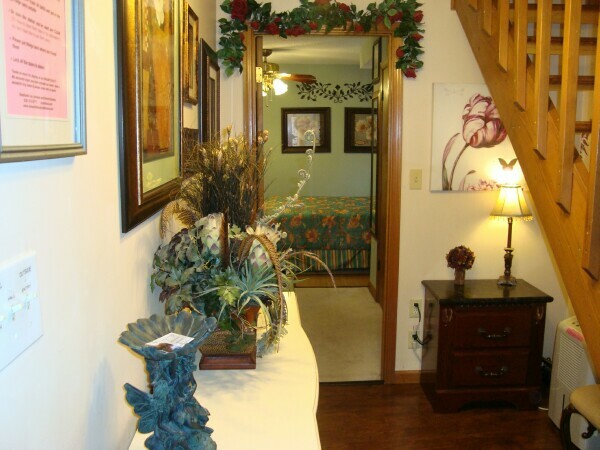 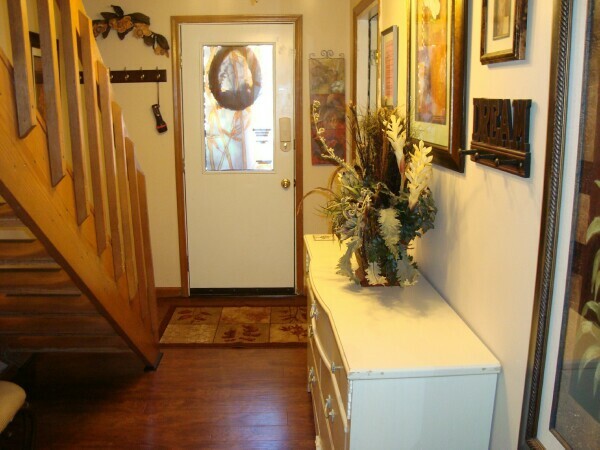 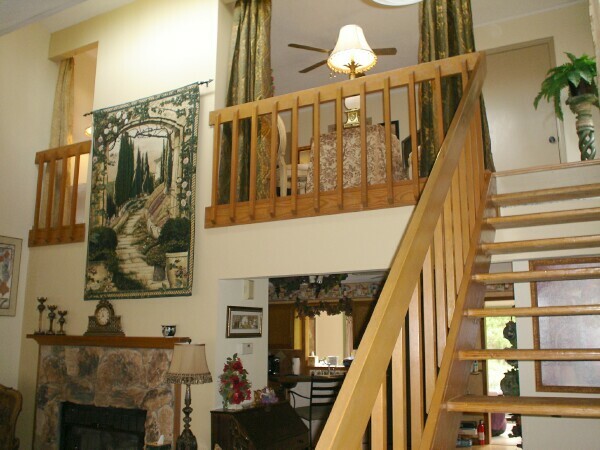 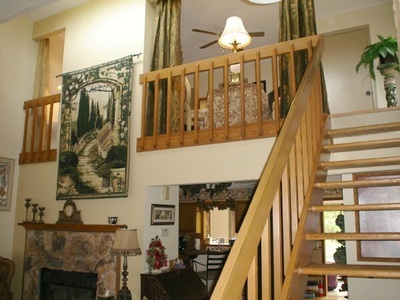 ENTRY FOYER: Greets you with elegance & charm. Ground level entrance. 2 Queen Bedrooms & Bath off this hallway. 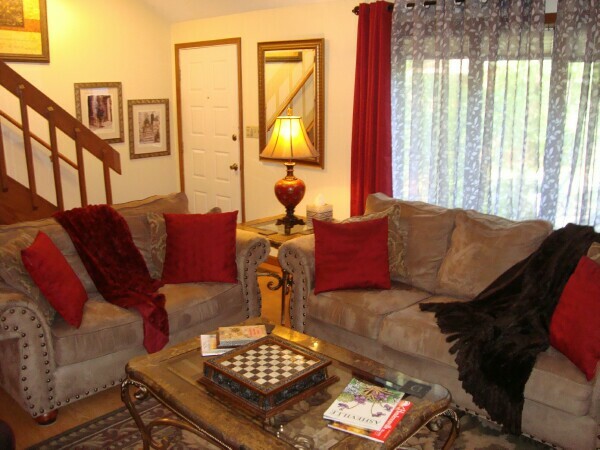 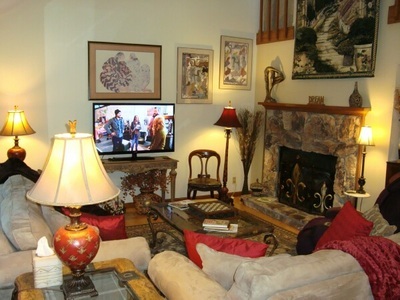 The Dream Chalet has central heat and air conditioning, phones for local calls, & 5 TVs throughtout. 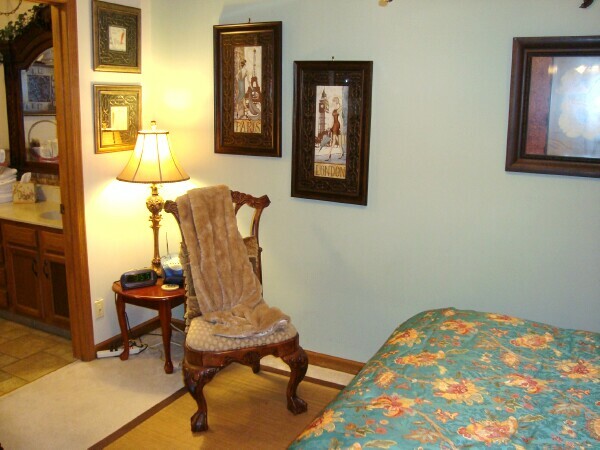 There is wireless high speed Internet connection. 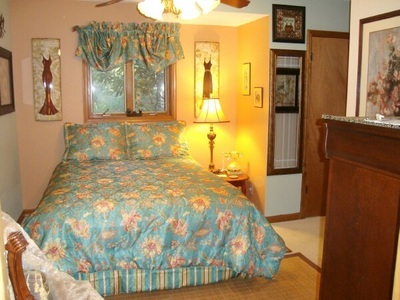 It is tastefully decorated with quality furnishings and thoughtful touches. 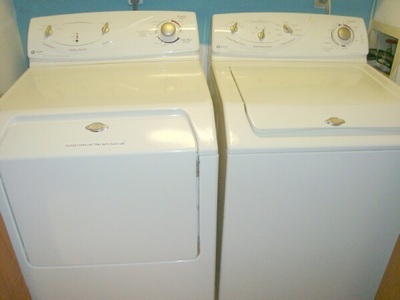 There’s a full size washer and dryer for your use. We’ve even included some fun board games, jigsaw puzzles, Playstation 2 with games and don’t forget the extensive movie library for your entertainment! 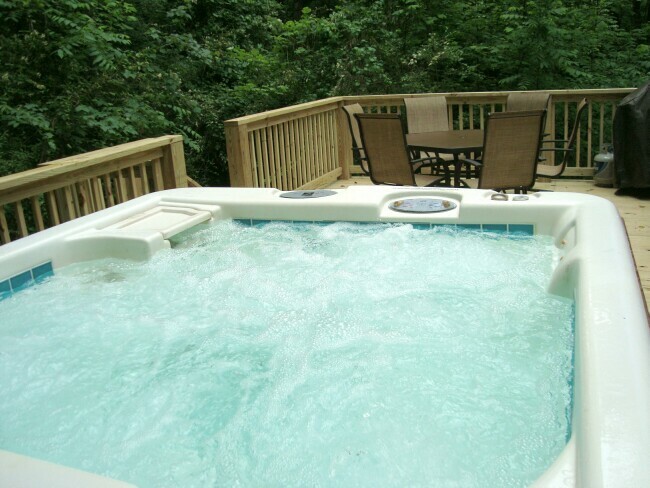 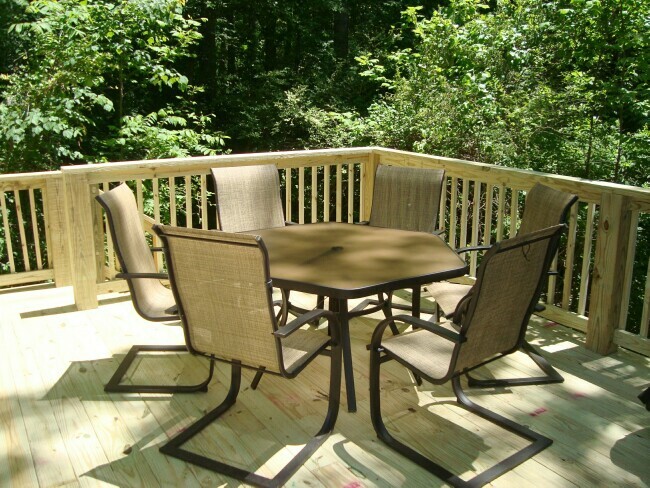 OUTSIDE is a large back deck with a 6 person hot tub, gas grill and patio table with 6 chairs which backs up to a lovely woodlands area. 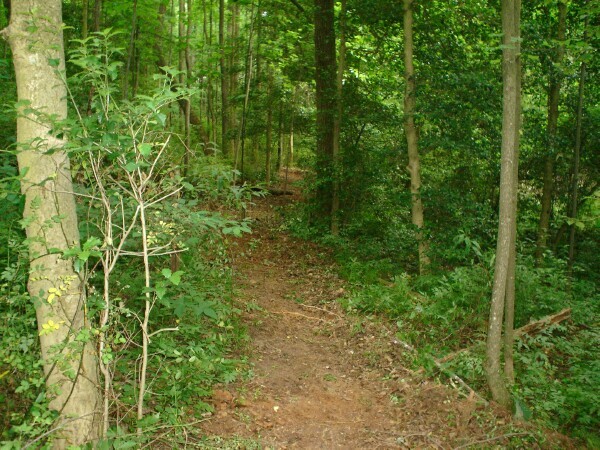 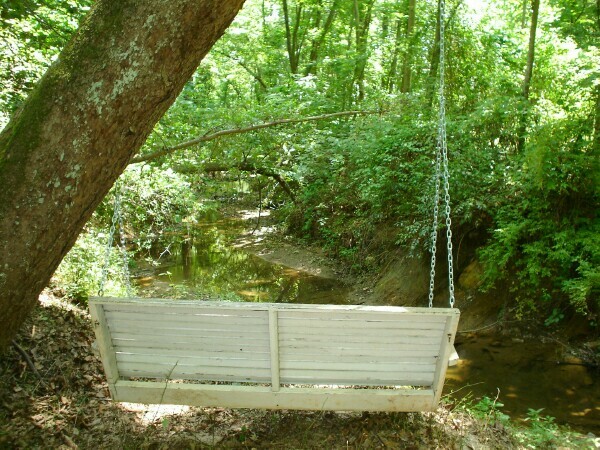 The stairway off the deck lead to a winding trail to the creek with a swing suspended from a tree. Massage Chair - state of the art "Hands on Technology,"